My huz is such a gem! So, I thought perhaps I’d interview him on my blog Writing to Distraction. http://writingtodistraction.blogspot.com/2012/10/a-visit-with-huz-inside-scoop-on-inside.html To my delight, he said, “Sure”. Well, first he said, “What for?” When I told him that I thought readers would be interested in hearing his POV on things he agreed. Yes, he knows what a POV is. He’s learning lots about writing, whether he realizes it or not. Brad’s a great sounding board and has really been so supportive with my writing career. I’m very blessed. And then it hit me. . . I bet there are quite a few good men who stand behind their author wives careers. Why not interview them as well. So I asked some of my friends if they thought they could wrangle their better halves into doing an interview. The idea was a big hit and a blog series was born—A Visit with the Huz: the inside scoop on (author). In addition to your own Gina Welborn’s husband, Jeremy, this series will include interviews from the husbands of Susan Page Davis, Kelly Long, Julie Lessman, Myra Johnson, MaryLu Tyndall, and more. It should be interesting! Doing the interview with my huz was fun. Brad’s so cute, but don’t tell him I said so. He’s a real dude and I don’t want to crush his opinion of himself! He is also quite thoughtful and supportive. That includes the time he escorted me to a regency gala (see pic), and doing the interview. I start the interview by asking several questions that will tell us a little bit about the author’s huz: what he does for work, what he likes to read, about the couple, and his inside view of his authoress wife. The last two questions in the interview are answered by the wife, and provide an opportunity for her to brag about her husband, and to share what she appreciates about him as he supports her career as an author. That was the special part. After Brad so graciously answered my questions, I told him with how important he is to me and how thankful I am that he supports what I do as an author. I was sure to give him specific examples of the things that I notice that he does for me. I know it isn’t easy for him when I’m traveling, researching, and writing for hours on end. His vocation and interests are important to me, too. So I’m glad for the opportunity to brag on him a little bit since his wife is such a “famous” author now. It’s amazing how many people believe that. But you know, it is just me, at home, clicking away on my keyboard with a husband who gets such a kick out of the fact that his beloved is seeing her dreams come true. I hope you’ll join me at Writing to Distraction http://writingtodistraction.blogspot.com on Fridays to see what these fabulous husbands have to say. QUESTION OF THE DAY:: How does your husband show his support of your career? A native New Englander, Carla Olson Gade, grew up in an historic Massachusetts town and now lives in rural Maine with her husband and two young adult sons. Her love for writing and eras gone by turned her attention to writing historical Christian romance. Represented by MacGregor Literary Agency, she is the author of The Shadow Catcher's Daughter (Heartsong Presents) and “Carving a Future” in the Colonial Courtships novella collection (Barbour). Carla is a member of American Christian Fiction Writers and Maine Fellowship of Christian Writers. Throughout the years, Carla has been a conference planner and taught many ministry groups, workshops, and courses, presenting on Biblical topics, genealogy, writing, and adult literacy. Unexpected adventure has the four Ingersoll brothers rethinking their futures. But will it thwart their plans for good or bring about four colonial courtships? Welcome, Carla. That was fun. I read your husband's interview and Jeremy's. What a cool idea. Thank you for sharing it with us. It's nice to get the husband's POV! Great idea Carla! It's nice to see you here. 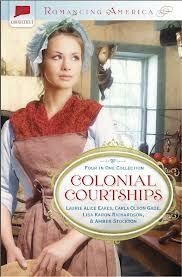 Colonial Courtships was one of my favorite reads this year! Thanks for hanging out with us today. I know things are always hopping over at Colonial Quills as well. And mondays are a great day to go visit!!!! Hi Carla, fun idea. My husband enjoys helping me brainstorm. He's a big idea guy. And he did read my few books, but my most recent novel is straight up romance, and I don't think he's made it through that one yet, although he has quoted some of the funny dialogue from the beginning. He's also good about being patient when I'm lost in writing world, which usually only happens in short spurts. Carla sent a lovely author photo that I couldn't get uploaded no matter how many ways I tried. Welcome, Carla, and thank you for sharing with us your idea for Husband Interviews. It's fun reading a husband's take on his wife's writing career. It's so much fun meeting with my friends here at Inkwell Inspirations. Thanks for your awesome comments! I'd like to invite any of you published authors to participate in the husband interviews. Just let me know if you think your huz is game! No worries about the pic, Gina, I've been having trouble with blogger today, too. But it might be my internet connection due to the snow we are having here today. Fun post. I'm blessed to have a supportive husband, too! Great having you here, Carla! Hey Carla, I'm sorry I missed the discussion on Monday. Just call me un-organized this year - or would that be dis-organized? I feel like one of those plates spinning atop a spindly pole in some circus act. Great idea for a blog series! I'll make an effort to stop by. My hubby showed his support by fixing up an office for me. He ensures there's oil for the furnace out there, and keeps the walk clear of snow and ice. He's also bought me flowers when I've finished a book and also when I signed with my fabulous agent. Of course there's more, but I have to clean the kitchen after cooking up 20# of potatoes yesterday then running out the door and into the blinding snow to get to the church on time.